The jungles of Karlapat wildlife sanctuary, situated around 32 km from Bhawanipatna, provide the setting for another of Orissa’s charming waterfalls name as ‘Khanduala’. 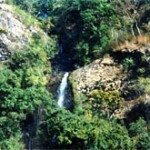 It is so named because of the shrine of the Goddess Khanduala situated on the top of the hill. This entry was posted in Khanduala, Orissa. Bookmark the permalink.